We’ve traveled all over the world and have been on many riding trips. Cappadocia, Turkey ranks among the best, if not THE best trip we’ve taken! Turkey offered everything we love about a vacation; scenery, history, culture, cuisine, great adventure and of course, horses! Julie Snyder, Equitrekking’s Virtuoso travel agent, arranged our dates and desires and it was done. Working with travel partners in Turkey, Julie created a very personal and exotic vacation fantastic beyond our wildest imagination. We spent a few days in Istanbul taking in the sights with excellent pre-arranged tours. The location of our charming hotel gave us time to wander through the streets of the old city and the grand bazaar. Although we loved Istanbul, we were anxious to get into the countryside and explore on horseback. The horses in Turkey, a cross of Arabians and native-bred mares, were among the best trained we’ve encountered, well suited for the environment and unfazed by any situation. I felt totally trusting of our sturdy, willing mares which made for relaxed riding. Our guide, Ender, was as caring of the horses as he was of his riders. 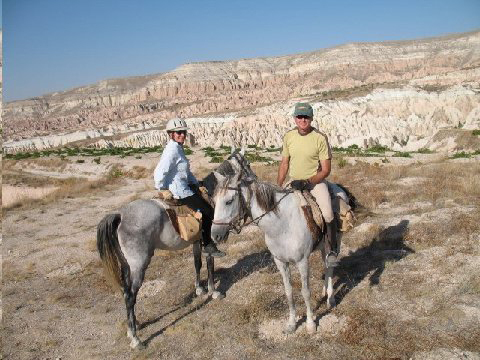 Read about this vacation in Susan's “Turkish Delight” in the Albuquerque Journal’s Boomer magazine, and then watch the video below of Equitrekking Travel's special Cappadocia equestrian vacations.